Rarely seen on the big screen, you can the classic piece of kitchensink, A Taste Of Honey, at the Manchester Cornerhouse cinema for one showing only on Sunday September 24th. 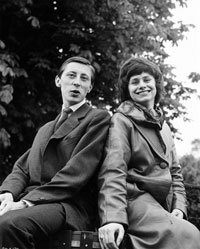 Directed by Tony Richardson and starring Rita Tushingham, Dora Bryan, Robert Stephens and Murray Melvin, the movie is a classic period piece of the Manchester area of the early 60s, helped very much by Richardson’s insistence that the film, as much as possible, should be shot out on location. A Taste Of Honey is an adaptation of Shelagh Delaney’s play about a Salford teenager, Jo, who becomes pregnant by a black sailor. With her mother showing no concern about her situation, she befriends Geoff, a gay man who moves in and looks after her – until her mother returns to shatter their happiness. The film is showing as part of the Cornerhouse Cinema’s Breakfast Club, a fortnightly event that offers a classic movie and a full English (or veggie) breakfast for £8.50. Book early – they often sell out.